A warm’ bienvenidos!’ awaits you at this luxury camping site situated on Spain’s popular Costa Brava where you and your family can enjoy the delights of a camping holiday at one of LUX-camp’s premier sites. 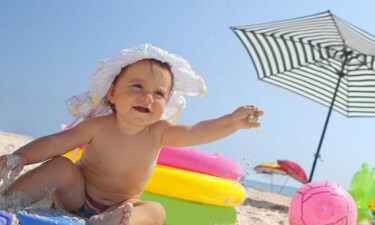 Contact LUX-camp to book your dream camping holiday today. Welcome to Camping Tucan Campsite! Is Camping Tucan for me? These are just a few of the delights to be found at the Camping Tucan Campsite – come and discover lots more for yourself! Luxury camping means different things to different people and the choice of accommodation styles available at Camping Tucan means your requirements are sure to be satisfied. Mobile homes start with the excellent value 2-person variety and rise to the air-conditioned luxury of models that can sleep up to six and have their own shaded terrace area for relaxing and dining al fresco. Swimming Pools? Chill or Thrill! 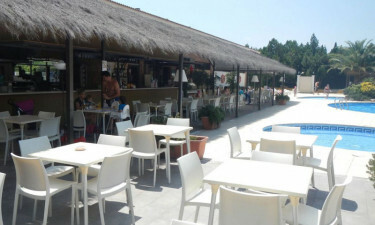 Camping Tucan is centred around its beautiful pool complex. Here, adults can laze in the serene, tranquil pool, unwind and let any stresses just drift away; for children, there is a water-themed playground filled with fun features that will delight any child and become a firm holiday favourite. In addition, for the young (and young at heart!) who need that ‘rush’, there are waterslides that will excite and delight. 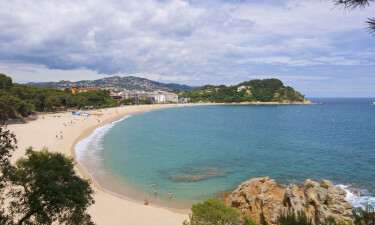 If you need a more natural water experience, Lloret beach is a mere 600m away; a small, sparkling cove nestled at the foot of a rocky path and surrounded by pine forest - beautiful and breath-taking. If your family holiday is predominantly self-catering, there is a mini supermarket on-site that will meet your basic requirements and a bakery where freshly-baked bread and delicious pastries can be bought. Venture out into the beautiful town of LLoret de Mar to find shops and markets selling a wide variety of general and local produce. This town has many restaurants and cafés and, with its range of museums and noteworthy architecture, is well worth a visit for those who need to satisfy their cultural appetites as well as their culinary ones. Back on-site, there is the option of having a satisfying meal at the camp restaurant, or just a drink at the bar as you reflect on another day well spent. Whatever a luxury camping holiday means for you, Camp Tucan are sure to make your stay a memorable one. LUX-camp is happy to assist with booking or any other inquiries.